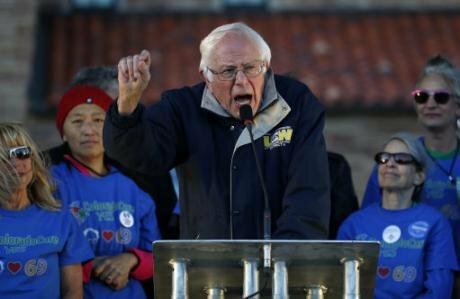 Bernie Sanders speaks to supporters at a rally in support of the nation's first universal health-care system, in Boulder, Colo., October 17, 2016. Brennan Linsley/Press Association. All rights reserved.All mainstream European newspapers professed themselves “shocked” by Trump's victory. Representing large swathes of liberal and institutional elites, they expressed fears that his presidency will be destabilising and adventurist for both sides of the Atlantic. Le Monde characterised the victory as "a fundamental transformation" comparable to the fall of the Berlin Wall and 9/11. For The Guardian, Trump "will halt all the progressive narrative about America in the 21st Century"; further, xenophobic and right-wing Europeans, with Le Pen first among them, will be "jumping on Trump's bandwagon", whereas Moscow and Damascus "will cheer" and the "Latvian" and the Ukrainian" will suffer. Handelsblatt, Germany's financial daily, connects Trump to a serious threat to "the liberal international order". Paul Krugman complains that this is a president who knows nothing of law, politics and economics, with an army of "bad advisors" in all of these respected disciplines. Some Italians draw parallels between Trump and Berlusconi, whereas some middle-to-upper-middle class white feminists wonder what Hillary got wrong about "gender equality". Yanis Varoufakis, belatedly, has realised that Trump's success means that "America, too, needs democracy", and not just the Eurozone, as his DiEM25 movement advocates. Then there are ‘explanations’. Michael Kazin in Foreign Affairs, brands Trump an "unlikely populist", and initiates a discussion drawn from the American populist traditions of the nineteenth century. Francis Fukuyama, too, turns his rage on Trump's "populist nationalism" and laments the fact that the working class is lost to the Democratic party, which is now a party of "identity politics: a coalition of women, African-Americans, Hispanics, environmentalists and the LGBT community". Others, quite rightly, blame the democratic establishment, which sidelined Bernie Sanders, an advocate of democratic socialism who could have taken on Trump, winning the vote of the declining, white, male working class, eventually cast to Trump. Indeed, Trump snatched Sanders' claim and argued openly that, unlike Clinton – the personification of Wall Street and the bureaucratised oligarchy of Washington DC – he could improve the conditions of those "who have been left behind by globalisation, failing domestic industries and crushed small businesses". Trump won the American election against all odds, even against his own Republican party, against the Wall Street and the Washington establishment, including large swathes of the media and the liberal-intellectual establishment. Something very similar happened in England with the Brexit referendum of 23 June: almost the entire City was behind the "Remain" campaign, as well as key departments of the British state and an army of intellectuals. Yet the "Leave" vote won. Marxists, such as Alex Callinicos, believe that after the Brexit vote of 23 June, the Trump victory represents the second major blow to globalisation, since the majority of the ruling classes of the two key imperial states that spear-headed it in the late 1970s stood behind politicians that finally lost, and lost even against the prediction of pollsters. Callinicos concludes that there is something deeper going on. That is correct. But what is it? In a remarkable passage in his Prison Notebooks, Antonio Gramsci, the incarcerated leader of the Italian Left in Mussolini's fascist Italy between the wars, wrote that in international politics and economics we need to distinguish between what he called "organic movements", relatively permanent, from movements which may be termed "conjunctural", and which appear as occasional, immediate, almost accidental. The Trump victory – and, for that matter, the Brexit vote of 23 June – is an epiphenomenon of the deeply embedded structural and historic changes and trends taking place in international political economy and the global system of power since the 1970s. Journalists, pundits, party-political personnel, politicians, tycoons, media discourses and pollsters, either for their own reasons or out of ignorance, avoid looking at matters structurally and historically: hence their false predictions and speculations. The most important, structural transformation that took place in the west after WWII was a massive crisis in manufacturing manifesting itself as stagflation (economic stagnation accompanied by double-digit inflation). This was the result of the exhaustion of demand-led, Keynesian economics and of the over-competitive, liberal international order that saw new centres of economic power (Germany, Japan) emerging and competing on an equal footing with the winner of WWII and big creditor, the USA. This competition drove down the rates of profit and investments, resulting in an unprecedented economic crisis, the collapse of the Bretton Woods system of fixed exchange rates and the devaluation of the US dollar. The USA became a debtor power, registering persistent losses in its balance of payments since the early 1960s. The global (capitalist) economic order in the 1970s collapsed because of the structural power-shift to the two strong economic ends of Eurasia, chiefly Germany and Japan. These fault-lines of the international system criss-crossed with the state-led economic structures of the Soviet bloc, putting massive pressure on both China and the USSR to open up, as indeed happened (China began opening up in the late 1970s and the Soviet Union, under Gorbachev, in the second half of the 1980s). From this perspective, we should point out that discourses by scholars of international relations that over-emphasise "the end of the Cold War", the "fall of the Berlin Wall" and the "end of Communism" and consider these events "monumental" are, in our view, rather ideological, western-centric and deeply misleading. As recovery within the old, demand-led global politico-economic system was not forthcoming, the liberal elites, first and foremost in the USA and Britain, broke away from the old consensus by way of unleashing money and financial services and taking advantage of the end of the monetary stability provided by the Bretton Woods system. The switch from demand-led to supply-led economics took place within an unbelievably punitive policy framework for waged labour and its welfare institutions (health, pensions, education), inasmuch as it was deemed responsible for the stagflation of the 1970s. The interest rate spike engineered by the American Fed under Paul Volcker in the 1980s did not just break "the back of inflation", as he argued, but also the back of the living wage, pushing American industry into irreversible decline and outsourcing (the work of Leo Panitch here is very important in understanding this process). Neo-liberal globalisation, under the aegis of Wall Street and the City of London, hereby laid down the policy constraints of new international and domestic orders, pushing parties of both the left and the right to converge within its programmatic remit. However, for a number of reasons, the project was doomed from the outset. The leading power behind it aiming at transplanting neo-liberal globalisation regimes around the world, the USA, was already an empire of debt entering a period of long, protracted, yet steady and statistically traceable decline. Buttressed by the power of the dollar as the globe's reserve currency in a floating exchange rate environment, the US attempted to provide leadership in a global political economy via a Treasury Bill Standard. This meant that countries with trade surpluses (e.g. Japan, Germany, Saudi Arabia, China etc.) would buy US paper propping up America's external and internal debts. In fact, this became and continues to be the case, introducing to the world an unprecedented and markedly unstable international monetary system, yet one that is not sustainable in the long run. This is why. Bernie Sanders supporter at first day of Democratic National Convention in Philadelphia, July 25, 2016. John Locher/Press Association. All rights reserved. All real, long-term, "organic" indicators, as Gramsci would have put it, worsened in this period, if compared with the so-called "golden age of capitalism" (1950-1970). Thus, unemployment, albeit manageable, became endemic; consumption was buttressed by borrowing rather than real wages; and technological innovation was used by export-led states to cannibalise markets rather than induce real and sustainable development (typical, in this respect, is the example of Germany within the Eurozone). Profits in the financial sector soared, but they were consumed among the rich and the speculative arbitragers, magnifying inequality and undermining growth and job creation. Pointedly, China's domestic reforms and its coming onto the global stage through the WTO, coupled with its export drive, cheap manufacturing products and purchasing of assets across the world, signalled a dramatic shift in global political economy, a shift in the centre of gravity from the Atlantic shores to Asia. The global chain of extreme financialisation and speculative profiteering broke in 2007-09, only to be transplanted into the Eurozone via the over-leveraged banking sector. Wall Street and the City of London were perplexed, and so were the German banks, which were the first to collapse in 2008, having purchased massive stocks of American CDOs (Collateralised Debt Obligations). The American Fed and the Bank of England "did the right thing", as Martin Wolf put it, in order to save capitalism, by pouring the right amounts of money into the system ("quantitative easing"), yet politics and ideology always lag behind. Both ruling parties across the Atlantic, with the partial exception of the Labour Party under Jeremy Corbyn and Sanders' faction within the Democratic Party, failed to see these large structural, "organic" historical movements. They have continued to generate policies, liberal discourses and media-led nonsense, including false electoral predictions, that did not correspond to these long-term tendencies and realities on the ground. Inequality has worsened markedly; real wages are on the wane as the share of labour in GDP fell drastically and the rate of creation of new jobs has slowed significantly, meaning that no substantive investment occurs on the part either of the private or the public sector; real GDP growth per person has been 1.4% a year, well below levels before the credit crunch of 2007-08; and reports from the IMF and OECD have forewarned us that global trade is contracting and that, as this is happening, a wave of protectionism is on the rise. This is all related to China's ascent. Last April, the Australians blocked a vast land sale to a Chinese-led consortium and last October Germany withdrew approval for the $1bn takeover of chip equipment maker "Aixtron" by a group of Chinese investors. The value of Chinese overseas acquisitions announced in the first nine months of 2016 totalled $191bn, almost double the inflows of foreign investment into China over the same period. This is a real challenge for traditional transatlantic interests. The paramount aim of the notorious Transatlantic Trade and Investment Partnership with the EU (TTIP), which is not forthcoming, and the Trans-Pacific Partnership (TPP) between the US and 11 other Asia-Pacific countries, is not just about how to pulverise nation-state power but also how to consolidate a western trade bloc to fight Chinese competition. 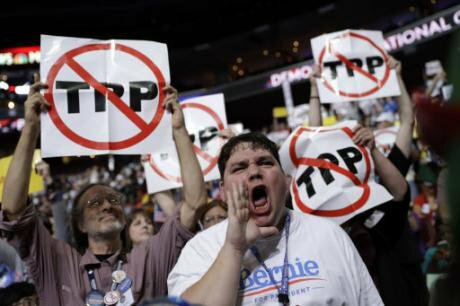 Pointedly, China is excluded from the US-led initiative of TPP. Trump’s boasted protection of US industry and jobs from Chinese competition was very appealing to voters and the unemployed. But Clinton continued riding on the old and declining financial wagon of Wall Street and Washington's liberal establishment (pretty much like the "Remain" campaign in England in the run-up to the referendum of June 23, the sole exception being the new leading group in the Labour Party under Corbyn). The upper middle class Clinton's talk of women’s rights failed to convince the Latino woman worker, who works the night-shift in Wall Mart on a meagre salary and with no rights at all. Trump and, for that matter, Bernie Sanders – wrongly sidelined by the democratic establishment in the primaries – understood better the global shift and the class issues involved in it, than the Democrats. (And in that respect, it has to be said that Trump and his advisers understand economics better than Krugman.) In London, The Guardian lamented that 53% of women pushed Trump to victory. Indeed, black and Hispanic female voters opted overwhelmingly for Trump at the very moment when Trump argued for building a wall on the border with Mexico! Class matters more than hollow appeals to identity politics issues at the moment when class inequality is rising sharply. "Between 1980 and the most recent period", Martin Wolf wrote in Financial Times, "the top 1 per cent in pre-tax income jumped from 10 per cent to 18 per cent". And he continues: "Even after tax, it rose by a third, from 8 to 12 per cent. The rise in compensation of chief executives, relative to that of workers, has been huge. The US has the highest inequality of any high-income country and has seen the fastest rise in inequality among the seven leading high-income countries". If you work for Wall Mart you are not an "employee". An "employee" has rights. In Wall Mart you are an "Associate". As such, you have no fundamental rights and you are not protected by labour legislation and agreements crafted by trade unions and businesses. Similar industrial practices have been adopted in Britain and Europe by major enterprises and multi-national corporations. In the long history of (pre-modern and modern) global political economy, crises come and go, as do the focal points around which they form. To understand the dynamics of the current process of change we must also understand the history that gives it volume and reach. The long crisis that began in the 1970s remains unresolved as neo-liberal globalisation failed to provide a response within the remit of the western-led global capitalist system. If anything, it brought new global players with it, challenging the supremacy of the US and its European allies. As such, it brought about fundamental changes in the world and has already generated irreversible geo-political consequences, such as the rise of China. We believe that Western capitalist economies have been in a long, structural, "organic" decline since the 1970s and, with them, the primacy of the US in the global economic system. To extend this claim to the level of "civilisation" is a different discourse altogether that we cannot address in this short article, although re-reading Oswald Spengler's opaque work, The Decline of the West, is good preparation. The victories of Trump in the US and the "Leave" campaign in Britain are but epiphenomena of momentous shifts in global political economy and international geo-political alignments that have been taking place since the 1970s. Right-wing forces win elections because they have read these "organic", long-term trends faster than the traditional "third way" Left and, from their own class perspective, have drawn their conclusions and elaborated their electoral tactics. They are not just "populists" (a term that should stop being used in a derogatory manner which, alas, has become a constant practice among liberal journalists) and, unlike Krugman's assertion to the opposite, they do know how to appeal to the suffering working classes quite well. What about the Left? Having completely relinquished Keynesian policy-making in order to maintain its stakes in the governance of neo-liberal globalisation, the "third way" Lefts of the Clintons and Blairs have now lost any remaining credibility. To our minds, there is no doubt that had Bernie Sanders been nominated to take on Trump, he would have had a better chance to win the presidency and the contest would have been shaped along correct class demarcation lines, albeit social democratic ones. But the declining liberal-financial establishments of Wall Street and Washington DC that keep defending the bankrupt international order of neo-liberal globalisation prevented this from happening. It is for this reason that the prospects are quite bleak for the US and the rest of the world. Will Le Pen and the xenophobic Right in Europe benefit from Trump's victory? Of course they will. But whose fault will that be? That is anybody's guess.